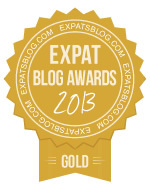 ExpatsBlog.com Expat Blog Awards 2013: USA Gold Award! Honest, fresh look at living in the US from an outsider's perspective! Always manages to make me smile, but is a good read for family & friends back home. Interesting stuff. Invaluable for people that are off to another country for a new adventure. Great reading for those at home to keep in touch with what is going on !! A really interesting read which provides laughter and sometimes tears. You don't often think about the obstacles that people face when moving abroad but this makes it real. Well done!